Keep your call centre motivated with quality!!! If you are like us and have been in the data and lead industry for a long time, then you will know exactly what we mean when we say 'searching for a good source of data or leads can be like walking through a minefield'. It is a shame that our industry is like this, but here at Diamond Data Solutions we have done something about it. If you are reading this then the chances are that you are either already a valuable client of ours or you are looking to purchase for your business. If you are the latter then let me explain what sets us apart. Firstly the difference with us is we use our years of experience and contacts within the industry to compile a portfolio of the most reliable and credible call centres in the UK and we run constant compliance checks with these call centres and list owners. This enables you to be fully confident that all your various campaigns you are running with us are with the appropriate call centres. We understand and empathise with are clients and are 100% transparent when it comes to our products. Our customer service is second to none, just read out testimonials! Our job is to do the searching and research for you within our network of affiliates, to make sure we are providing the best lead type for your product at the best price, so you can achieve maximum profit for your business. When it is all said and done, we know that if this is done properly we will have a client that is confident in our ability and therefore will be with us for the long run, to provide you with exactly what you need without the stress involved in data purchasing that we all know is time consuming. 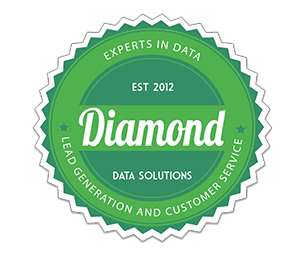 Let Diamond Data Solutions do all the hard work for you, and take the gambling element out of lead generation. So please browse our website, I am sure you will find exactly what you are looking for, then give us a call and let one of our advisors guide you to help maximize your companies potential. Diamond Data Solutions have one of the largest and most up-to-date business databases, with approximately 3.2 Million UK business records, covering all business sectors within the UK. With a 90% accuracy guarantee on mail and telephone data, Diamond Data Solutions can offer you one of the highest accuracy guarantee rates in the industry. We also have over 40 million consumer records available, which you can profile down using over a 1000 different variables and can profile your data by postcode. This ensures we bring you closer to your ideal customer than you ever thought possible. Lead generation is a complex operation and two campaigns should never be the same. As every company has it's own criteria, clientele and products. Different approaches work well for different companies. So it’s our job to help guide you to which form of lead generation will work best for your campaign. For example, if you are a small company with no outbound operation there is no point speaking to you about data. The same as if you have a successful call centre it might not be necessary to pay the extra money for live hot-key transfers. This is why we have experienced BDM’s to help and assist you by guiding you to the right kind of lead for your campaign. Email broadcasts are efficient because over half of all people that use the internet check their emails on a daily basis. However email broadcasts can only be as successful as the data used. This is why Diamond Data Solutions uses email data which is call centre verified ensuring that the email addresses are actually ACTIVE addresses. This is why we will replace all hard bounces, again setting new standards in this highly competitive market. SMS broadcasting is a very powerful marketing tool, this is because it gives you the power of being able to reach your target audience at all times. However you will probably agree they can be annoying and this means high volumes have to be broadcast to ensure high volumes of leads to come back. Because SMS's are much more expensive to send than say emails, this can work against this particular type of lead. However Diamond Data Solutions yet again have set new standards and offer you the opportunity to purchase only the positive responses from a broadcast. So no longer do you have to cross your fingers and hope for a good response. If you need and require 500 SMS leads we will generate them by mass broadcasting. Let Diamond Data Solutions take the risk! Customer Analysis. Contact your existing customers when they are most likely to buy. Prospect Acquisition. Link your best customers with look-a-like prospects. Data Cleansing is a process in which individual records are corrected or removed from our database because they are inaccurate, out of date or have now requested to be put on the TPS register. This is done to our central database every three months. But to insure our data is of the highest quality we have made it part of the order process. So before any dataset is delivered to the end user all out data is cleansed at point of delivery. Contact us on 0161-820-3935 or feel free to use the form below or chat live NOW! Please type in the number into the box below to prevent us from receiving automated messages. Thank you! Please note that due to changing regulations and advances in lead generation, not all of the products listed on this website will be available.